Age relaxation applicable as per State Goverment rule. XlIth Passed or equivalent with mathematics as a subject in Matriculation/ HSLC from recognized Board. Matriculate/ HSLC or equivalent from a recognized Board. Matriculate/ HSLC or its equivalent from a recognized Board. On the basis of the performance in Written Examination / Test and as per the preferences provided by candidate in the Common Application Form. 1. 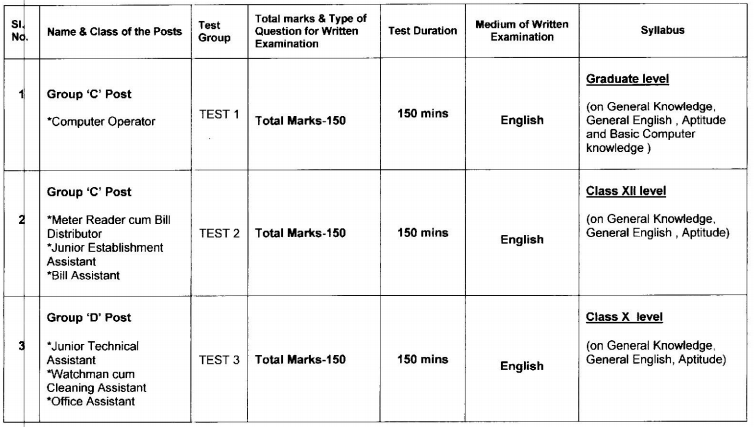 There will be a separate written examination / Common Test – 1 for the Group C Post of Computer Operator. 1. The written examination / test will be of Objective Type with Multiple Choice Question. 2. The written examination / test will consist of 150 numbers of Multiple Choice Question to be answered in 150 minutes. 3. For the posts of Computer Operator, there will be a Typing Test and Computer Proficiency test after clearing the Written Examination. 4. For the post of Junior Establishment Assistant, there will be a Typing Test (30 word per minute in typing (English), relaxable for SC/ST candidate upto 25 words per minute in tying.) after clearing the Written Examination. The test will be of qualifying nature. Duly sponsored candidates from the respective Employment Exchange may submit applications form in the prescribed format along with needed documents to the Receipt/ issue Counter of MPDCL, Corporate Office, 3rd Floor, New Directorate Building near 2nd M.R. Gate, Imphal -Dimapur Road, Imphal, Manipur — 795001. Examination fee will be exempted for PWD candidates.